Tired of the hustle and bustle of the world in which we all live? Want to take a break and go where silence is king and the wonders of nature surround you and your dog? A pet friendly cabin is an ideal place to travel with your dog. There’s plenty of room to run and play, and you don’t have to leave them at home – your best friend misses you more than you know when you leave. Depending on the personality of your dog, this can result in fears of abandonment and lead to destructive behavior. Besides, what would be more fun for you both than an experience walking through the woods? As you pack, it’s easy to forget simple but important things your dog will need. Start with packing their water and food bowls and also an ample supply of their food. Portable pet bowls are best because you can carry them with you on your hikes. With these items, include a mat with a sticky bottom to secure the bowls from sliding and spilling. Just as it does at home, this will prevent stains and tripping hazards in the cabin. While on vacation, your dog will have plenty to do, so they won’t need toys, right? Like at home, your dog can get bored or will need to be occupied during times of rest. Their toys from home will be comforting to them while in a strange environment. Why not bring things for them to fetch to give them extra exercise? Toys appropriate for inside and outside play are necessary for your packing list: Frisbees, balls and dirty ropes are perfect for outside. Rubber chickens, chews and non-squeaky toys are best for inside play. Will it be hot or cold? Will your dog be able to handle the prevailing temperatures? Make the transition easier on your pet by supplying additional water, pet sweaters and blankets. Oh, and bring plenty of pet towels to dry them when they jump in the creek! Your pet will be sleeping in a completely different environment, and it’s important to make them as comfortable as possible. Bring the bed they use at home if at all possible or consider a pet travel bed. Will your dog sleep in their typical room, even if the environment is different, or will they need to sleep by your bed? Your cabin may not allow your dog to sleep in the bed with you. Does your dog require important medications? Do not forget those vital prescriptions, and it may be necessary to have your veterinarian order additional medicine in case. Bring your veterinarian’s contact information with you and know where the nearest veterinary hospital is in case of emergencies. Dogs can develop allergies during the winter, so be prepared for this when shifting from a hot to a cold environment. Your dog may get sniffly or have itchy skin just like you do when the seasons abruptly shift. Hydrogen peroxide can be used to induce vomiting, if your dog eats something they shouldn’t. Ask your veterinarian first! Your veterinarian can also recommend a good pet-first aid kit if you prefer to buy one. One of the most prominent and understandable triggers for pet anxiety is volatile weather. Research weather conditions before you head to the cabin. In the case of a severe storm, calming methods will help ground your pet. Simply sitting with your dog usually calms them, and you can try to distract your pet with their favorite toy. Just as you might use swaddling to help a baby fall asleep, thunderstorm sweaters are also made for dogs. A trainer may be able to help by recommending playing low recordings of storms on a regular but short-term basis to overcome their fear or develop a healthy coping mechanism. All natural pet calmers can also help take the edge off any anxiety that your pup may feel. Before you leave, research leash laws in the area you’ll be visiting. If hiking on trails with your dog, must pets be leashed, or is it safe for them to run free? What about when you go into town? Best always to leash your dog when around other people in places not familiar to them, no matter how friendly they are with you and those people they know. Observe leash laws and keep your dog happy, as many parks require the removal of renegade or noisy pets. Bring along sanitary bags to dispose of pet waste in an environmentally-friendly way when on a hike. Some parks have regulations for your pet’s bathroom breaks. An effective solution to keeping your pet comfortable and happy on your getaway is to make a cabin pet space. You can repurpose unused areas in the den to create a cozy sleeping spot by the fire, and use gates to give your dog designated roaming places. If your dog is pad-trained and appreciates privacy, place their potty place under the sink or in another out of the way place. Try to place pet spaces in familiar areas, but with a little routine, your dog will get used to their new spaces. They’ll also feel more at home on the family vacation. Establishing a vacation routine with your dog is one of the most helpful things you can do once you’re at the cabin. 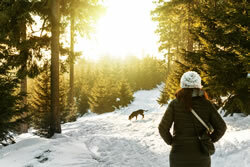 Simulate your daily routine with your dog while at the cabin as closely as possible to what you follow at home. For example, feed and walk your pet, get up in the morning and go to bed at night close to the times you do every day. These ten tips will help your dog enjoy their stay and enhance the fun of your trip. No one wants to leave their furry best friend at home. Pack with your dog’s comfort and fun in mind, and it’ll be a memorable trip for all. Here is one website that offers pet friendly cabins for destinations worldwide. and cultures, all while portraying her love for the world around her through her visually pleasing, culturally embracing and inspiring posts. Along with writing for her blog, she frequently writes for sites like US Travel News, Thought Catalog, Style Me Pretty, Tripping.com and more!